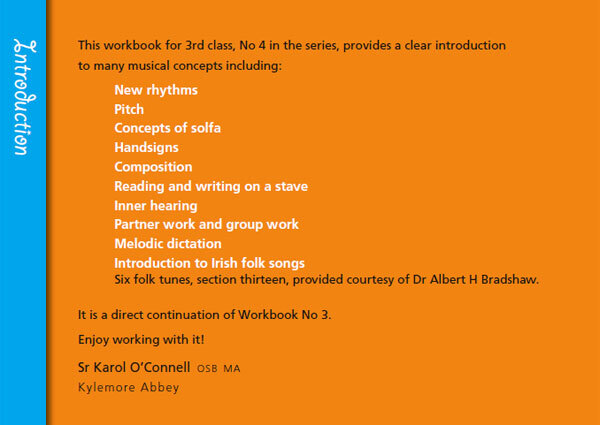 It is a direct continuation of Workbook No 3. Section 1 introduces three new rhythms. 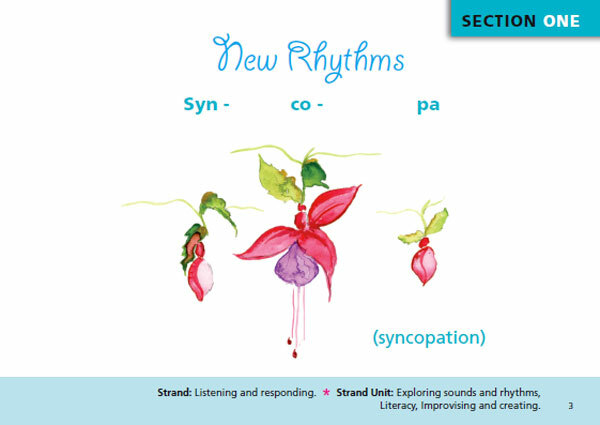 Syn-co-pa, (syncopation), tiritiri and the triplet = triola. followed by many different types of exercise on all three rhythms. Singing exercises, written exercises and clapping exercises. 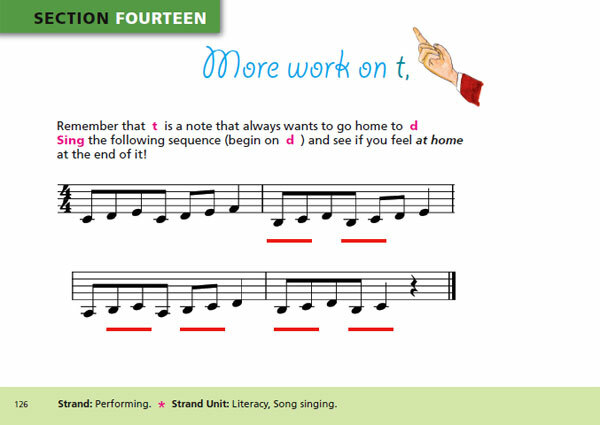 The exercises on pages 13 to 15 should be clapped while saying the rhythms before writing them. 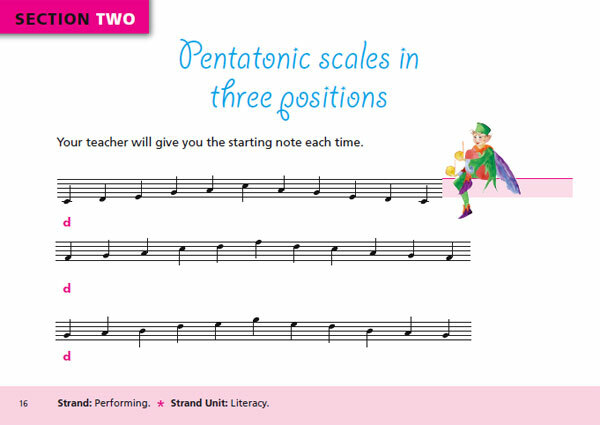 Section 2 deals with the pentatonic scale in three different positions along with its extended notes. 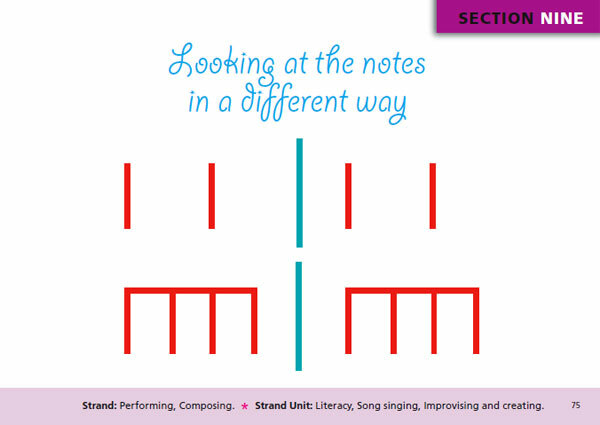 This section has many more sight reading exercises, reading from stick and staff notation. 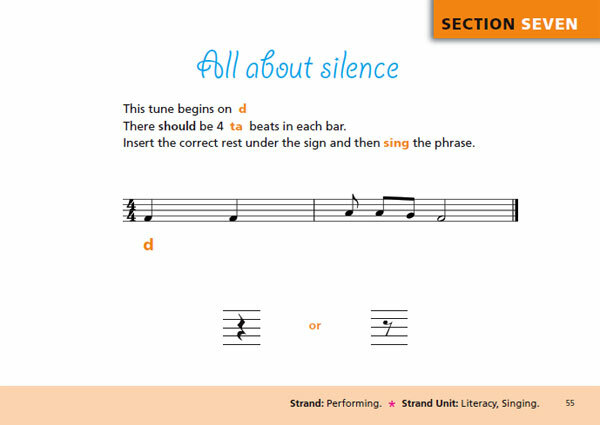 It is a section that can be read and re-read using percussion instruments. 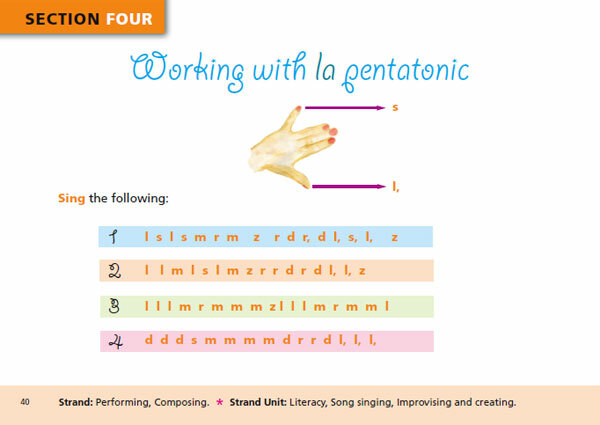 The children learn to do simple rhythmic ostinatos while singing, these can be done by a small group within the class, by a partner, or by the individual as he/she sings. 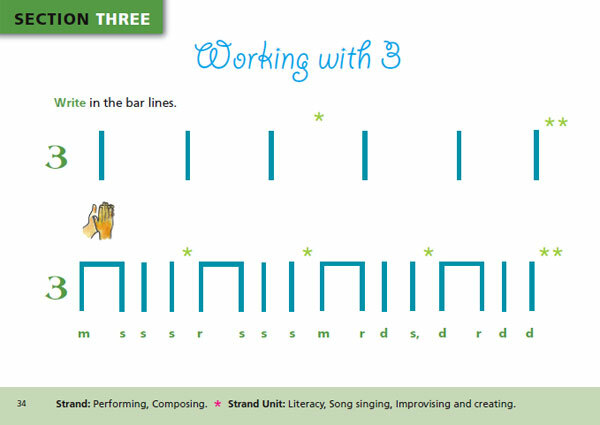 This section concentrates on working with three beats in a bar. Remember until this point the child has been mainly working with four beats and two beats. Here it is worthwhile to emphasise the different position of the hand stave, index, middle and ring finger close together, thumb and pinkie apart. The exercises on page 40 can be done many times. Making the Tone Set is introduced in this section. This is a very handy tool to use while preparing exercises and tunes. Take care with pages 42, 43 and 44, singing in tune and repeating these pages many times is better than doing them once and never getting the interval of an 8ve in tune. 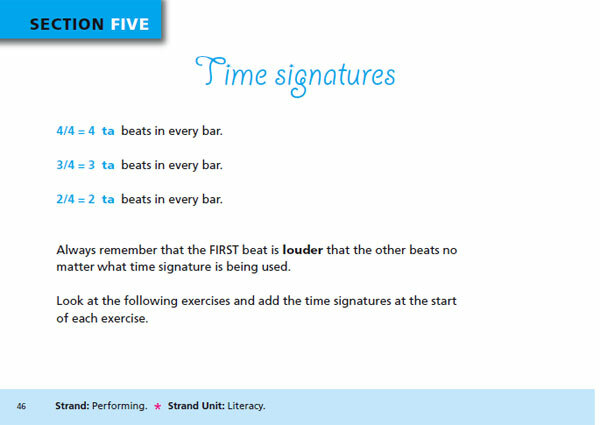 Time Signatures are introduced for the first time in the series, from now on the music used will appear with time signatures. 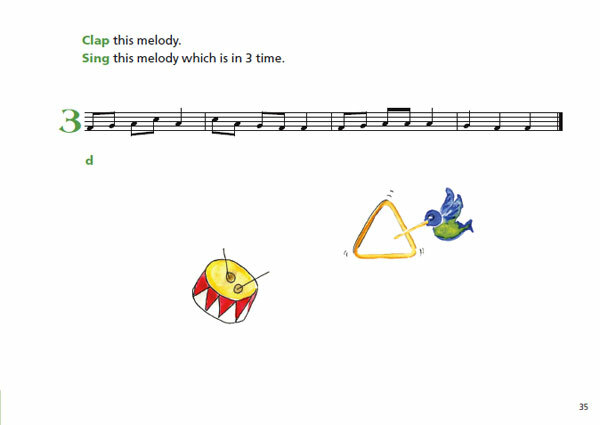 At this stage, it is enough to attract the child’s attention to the upper number and simply tell the child that if the lower number is 4 (and it will be for the present) it simply means that the value of the beat is a ta note. At this stage it is a good idea to examine some music and note how the time signature and each bar of music relates to it within a given piece. The ti rest is introduced with plenty of written exercises, make sure the child separates the hands in showing this rest. It will not be as big a gesture as the ta rest, keep the arms closer together. Then the song Button you must wander follows with a series of ostinatos to work on. These activities should be used over several classes. 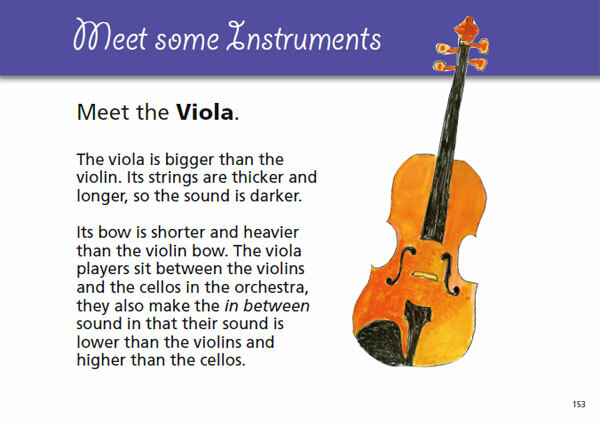 The percussion instruments and hands on the page indicate that they can be done in many ways. 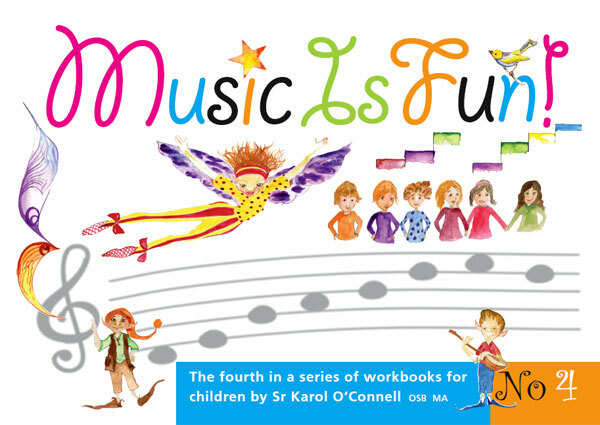 Let the children experiment and enjoy working with this tune. The last part of the section teaches the child how to draw the ta rest. Encourage the child to work slowly and accurately when it comes to writing this rest. Section 7 offers 10 pages of writing in the correct rests. These exercises should not be looked upon as written exercises only, if this happens the music will become too mathematical. Each exercise, when the rests have been added should be clapped and sung until an ease with reading is achieved. The section ends with a simple reading exercise on the triad. Aim for accuracy in intonation. (singing in tune). Section 8 introduces fa along with its hand sign. 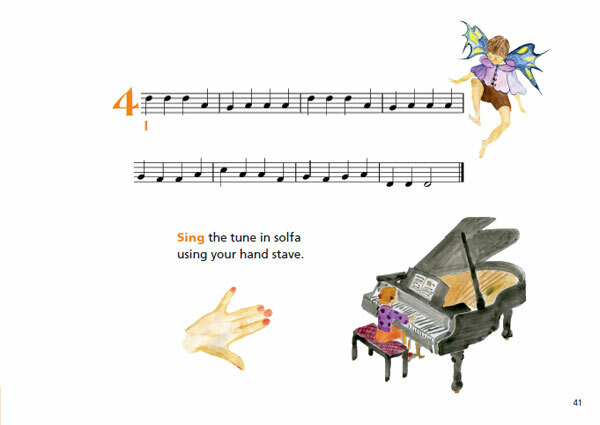 The child learns to sing it by listening to the teacher, learns to place it on the hand stave, and learns to sign it and read and sing it from stick and staff notation. 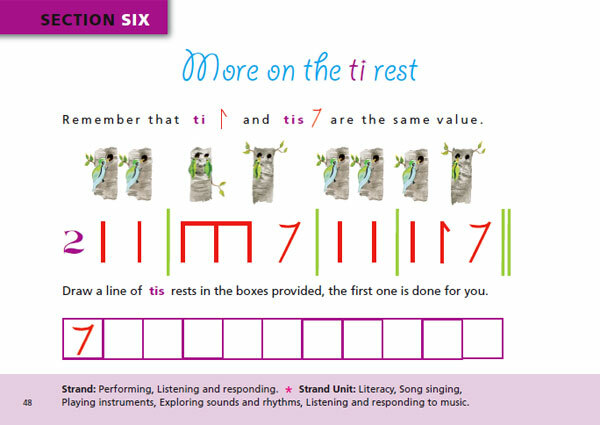 From page 67 to page 74 each exercise is firstly given in stick notation and then over the page in staff notation. 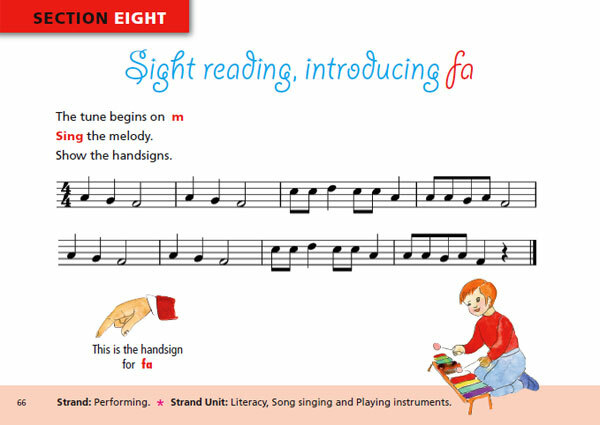 The reason for this is to encourage the child to learn to read with more fluency from the stave. 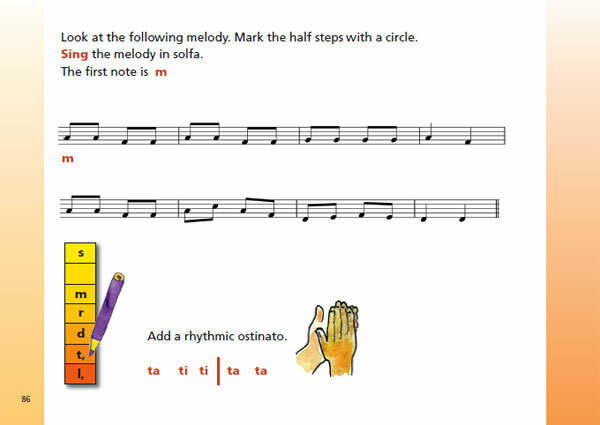 Section 9 introduces the child to the tied note, as well as revising some previously learned rhythms. The drawing on page 77 is a good way to explain a tied note to a young child. This section also contains some very simply canons and that children will manage without too much difficulty. When preparing these canons always get the entire class to sing through the complete piece of music before allowing them to sing in parts. Then introduce the canon by letting the children sing in two parts only, when this is secure the children will be able to sing in three parts. 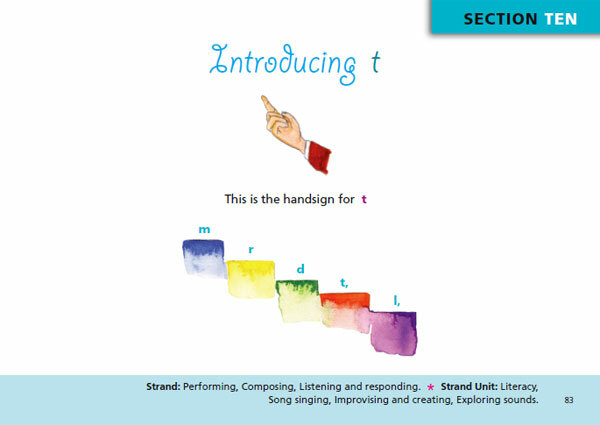 This section introduces ‘ti’ along with its hand sign and paves the way for the next section. Remember it is always sound before symbol. 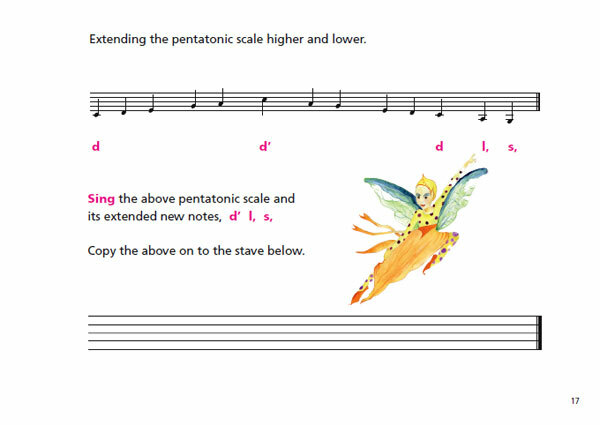 The child will hear how ti sounds within the musical phrase before the child learns the word, ‘semitone’ (half step). 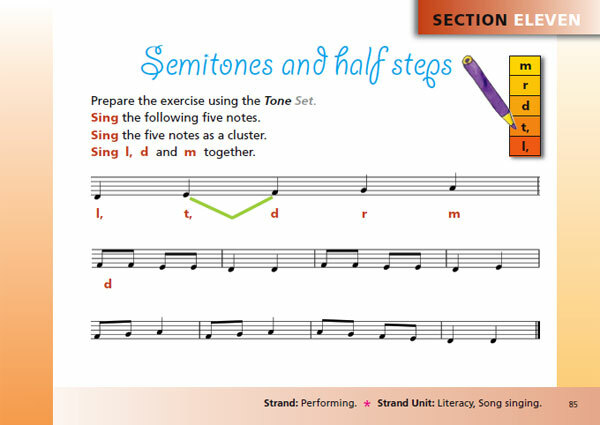 Working with semitones through reading many exercises, using tone sets. The exercises may be done initially without the ostinatos. Don’t forget to vary the way the ostinatos are used as well. Body percussion, table tapping, percussion instruments etc. 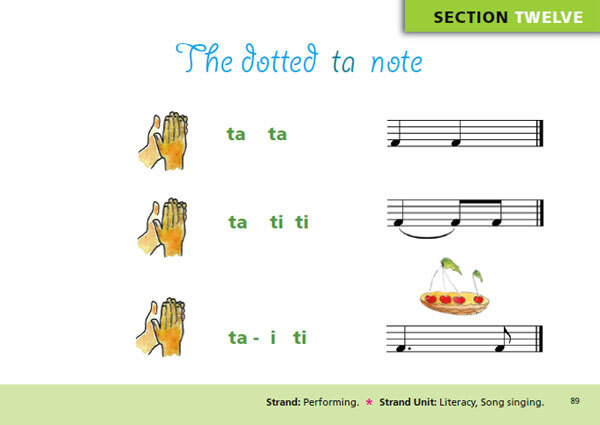 The dotted ta note is introduced and reinforced here through many reading exercises. 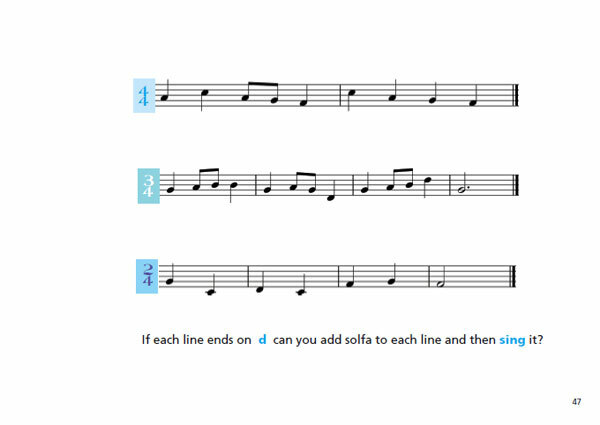 These exercises use the fa and the ti and can be used as sight reading exercises or musical studies to be examined in class. 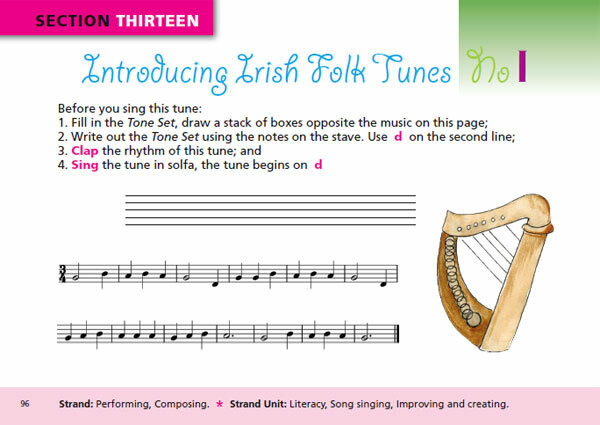 An introduction to Irish Folk Songs through solfa, each tune has its own set of exercises. 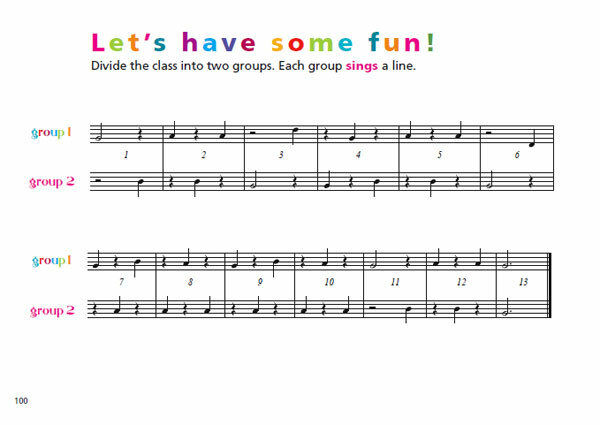 The idea is that each tune is worked on in class for at least five classes. 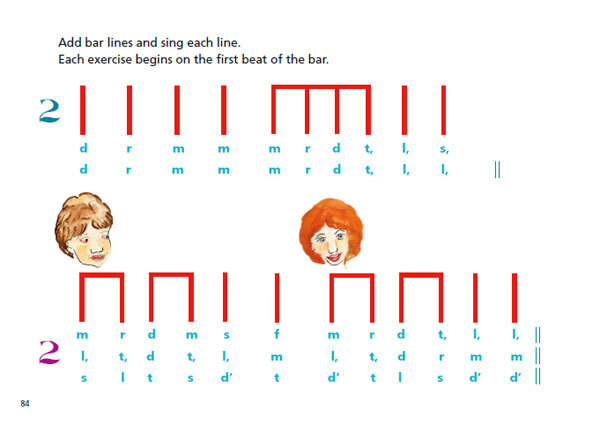 Ideally music class should take place each day for at least 15 mins when the children are doing exercises like this. The most challenging of the tunes will be No 6. Adding the chords- page 123- For this exercise be sure to study page 124. 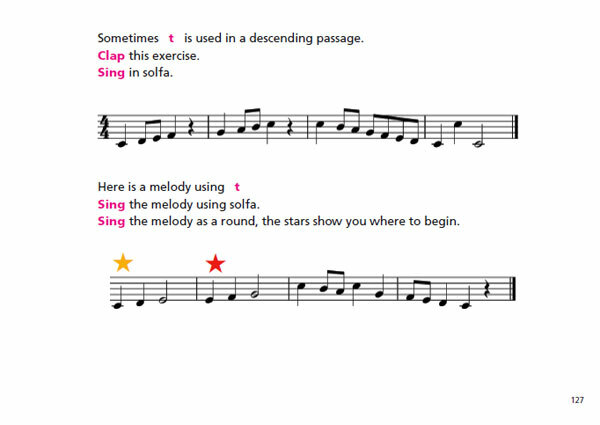 This is a very short section with some reading exercises reinforcing the‘t’ Two types of exercise are given- the student should ‘feel’ that the ‘t’ is a note always going somewhere. 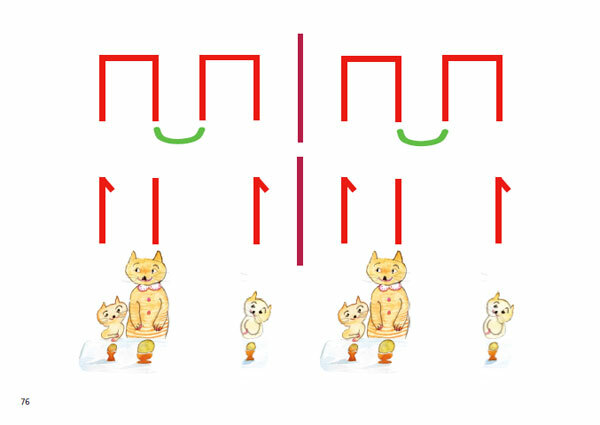 Point out to the students at this stage the ‘t’ that goes ‘home’ and the ‘t’ that appears in a descending passage. 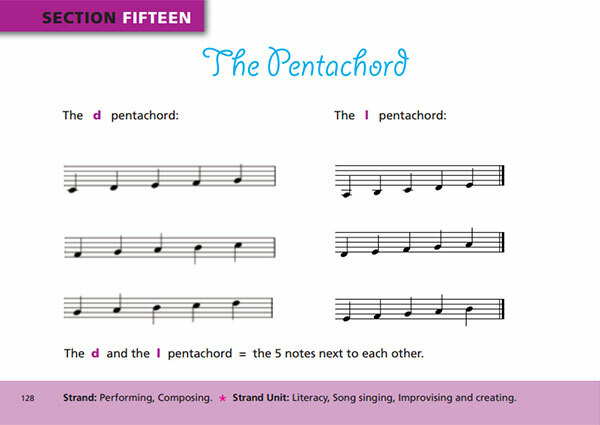 This section shows the ‘do’ pentachord and the ‘l’ pentachord with reading exercises on both. Then follows the Hexachord with seven pages for the student to compose 4 bar melodies based on the Hexachord. 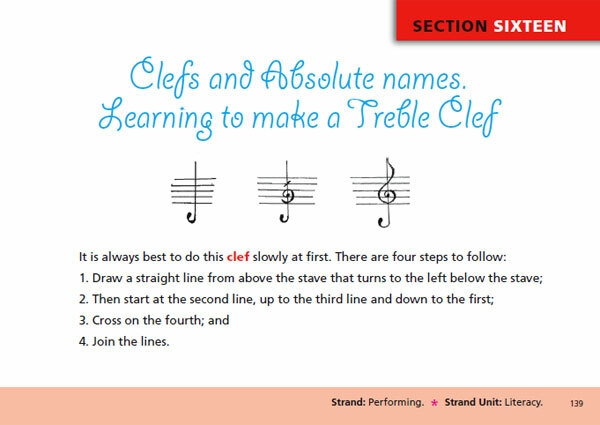 Here the student learns step by step how to make a treble clef with 72 blank staves for practice. The student should be encouraged to do these exercises slowly and accurately. Immediately there follows the learning of the absolute names of the notes. The student has the chance to read and write the names of the notes. Tagged on to this section is a section learning the absolute names of the notes below the stave. On page 151 there is a nice ‘round’ to sing in solfa. 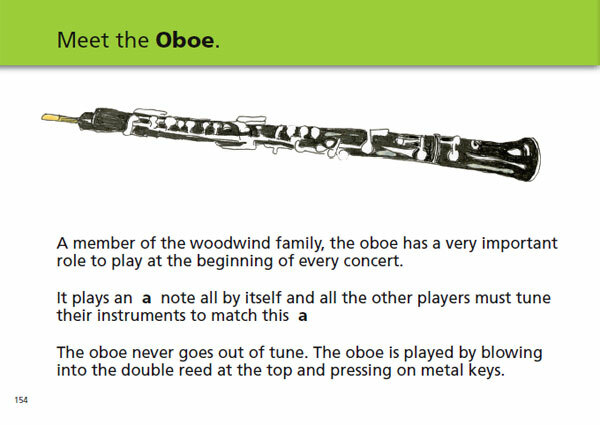 At the end of the book there are three new instruments to learn and page 156 has the usual instrument quiz.